My worshiping community, the Live Oak Friends Meeting, has a new floor. And it's a big deal. The old floor was irreparably damaged approximately eighteen months ago, by a leak in the pipe leading to the hot water heater. 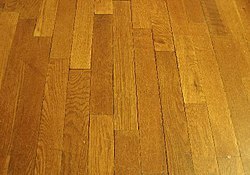 It was a beautiful hardwood floor, and replacing it was no simple matter. The Meeting House contains a Skyspace by contemporary luminary (and illuminary) artist James Turrell. The replacement materials had to be approved by the artist, suppliers flaked, and the continuing discernment of the Meeting ground on. "The floor" has been a saga with a fair amount of drama, sometimes under the surface, sometimes on display. As a movement educator, I appreciate the value of a good floor, and rarely take it for granted. Your action of standing, your weight pressing into the floor allows the floor to press into the soles of your feet -- that's how gravity works! Your skeleton springs, effortlessly, into the upright stance that distinguishes humanity from other species that have evolved in this planetary environment. To feel the ground clearly is to be able to move with power and skill, in a fully embodied expression of human-ness. .
Others must have felt it, too. Like the return of an old friend, people were smiling, warm, open. Emotions were vivid, vocal ministries flowed, Friends lingered in the space afterwards. As I paused to appreciate the shift into newfound stability, a thought came to me: it really is "All About That Base." The earworm was unleashed (you're welcome), an irreverent, playful, gentle gleam shone from my eyes, as I turned to greet and embrace my Friends. It is always good to be supported by something, or someone for that matter, that has known life.